Thought for the week: More corporate interest in Germany than political! We buy their cars and their companies, but could this misalignment become a problem? Despite the announced PX/LIN deal yesterday, the German government got involved only the day before suggesting that it was important to protect jobs in Germany. The PX/LIN deal is to be structured as a LIN acquisition of PX as a subsidiary. How will the German government react in the current climate if a by-product of DE’s announced deal is job losses in Germany? With the US administration pushing a “US first” agenda, other nations may begin to push back on US companies acquiring non-US companies and driving synergies through job-losses outside the US. 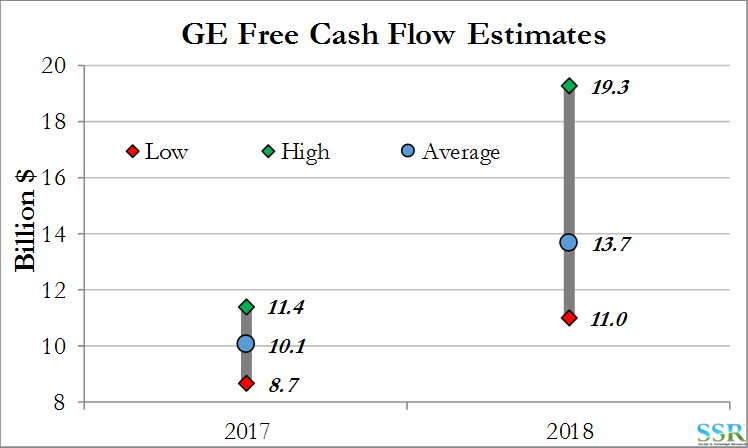 Last week, GE stepped back from targets on costs and earnings agreed with key shareholder, Trian, only 2 months after the targets were agreed – this against a backdrop of improving US and Chinese growth and a White House talking up the US economy at every opportunity. We see this as somewhat defeatist and it suggests that GE management does not have its arms around the company properly. Either the arms are too short (management is not up to it) or the company is too big. Regardless of the reason it is time for change at GE. While the company continues to miss targets its accounting is so complex that it is right to question whether they understand what they have. Cash flows do not correlate with earnings – and the regular question is whether cash flows show the underlying state of earnings or whether earnings show the underlying state of cash flows – if it is the former, there is less value in the company than we believe. Overwhelming everything is volatile cash accounting – around working capital changes and M&A that result in the range of estimates for 2018 shown in the exhibit below. With this range of estimates how can any investor understand what they have or get confident that the company understands what it is managing. It is time for a new quarterback at GE, as it was with DuPont in 2015, and it is time for a new and radical strategy. GE is down almost 13% since the beginning of the year while the S&P is up almost 8%. An old friend of mine who was a successful investment banker for many years moved to be head of M&A for one of his best clients. One day I saw him at the beach club that we both belonged to and he looked positively disillusioned – more tired and upset than I had ever seen him. His company had just lost a potential acquisition to a competitor. As he explained, as an advisor, you work on a deal, give it your best and if it does not work you get your fee and move on to the next. As a corporate, you put your heart and soul into a deal that may be years in the planning and core to your strategy – it is much less easy to shake off failure and there is often no similar opportunity or meaningful plan B. It is likely that PPG is feeling many emotions right now, not least being the frustration and disappointment of having a good idea shot down, but also looking back at the time, energy and money wasted. That said – we do not think that PPG is without a “Plan B”; in fact, we do not think that the failure of this deal has even dented the core strategy, which has been and will likely remain – purse organic growth; make bolt-on acquisitions where they can add meaningful value with limited risk; return surplus cash to shareholders. Akzo was a “bolt-on” acquisition in this sense – just a very big one! Where we do think that PPG will be challenged is on the value of possible alternative acquisitions, especially in Europe. Akzo would also like to expand in Europe based on its revised strategy, and may be the “higher bidder” based on its historic deal track record. We would like to see PPG reaffirm the “opportunistic acquisition” narrative, step up its buyback and possibly raise the dividend – reassurance would help support the stock price which looks relatively attractive versus other US larger cap diversified chemical names. Akzo concludes that it must separate chemicals because it said it would and does so regardless of market timing or value. Possible fire sale. We do not see material downside in the stock – it was cheap when PPG made its first move. However, we see no reason for the stock to go up from here – fully valued based potential outcomes. PPG much more interesting. Recall that we liked Azko originally because we expected and bid, and/or an activist. We got both – it’s over. 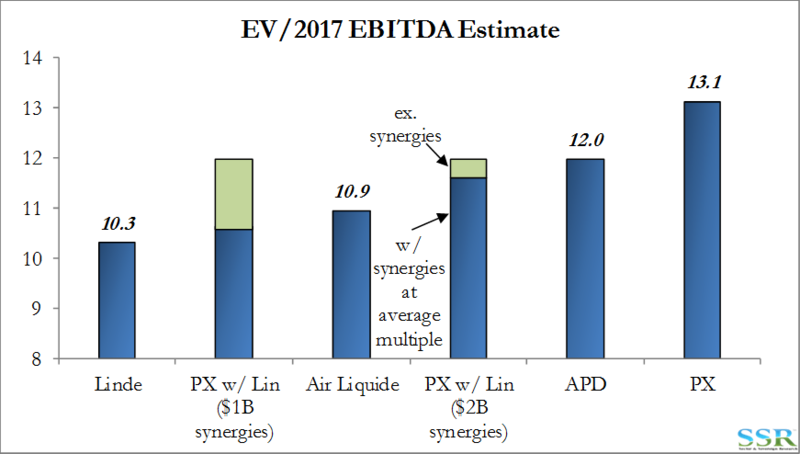 The announced Linde/PX merger terms provided by the companies yesterday, and discussed in the joint call today, give a little bit of a boost to Linde relative to PX, which we expected, but at the same time create a company that at first look could provide meaningful upside. We believe that the companies are being conservative on the synergy side both in terms of amount and timing, although we think that our higher estimate of synergies may take more than 3 years. We also think there are some revenue boosters to consider as the combined entity should be the low-cost provider of industrial gas facilities globally and should win share of the overall industry growth – even if it remains limited. With the level of synergies that we think are possible and a mid-peer EV/EBITDA multiple the stocks have as much as 25% upside from current levels. Faster revenue and EPS growth might warrant a higher multiple but we have been concerned for a while that the industry does not have the underlying growth to consume available cash flows in high value projects – see research – and that consequently the industry may re-rate negatively as underlying earnings growth slows. This is more likely to impact PX/LIN’s competitors, especially APD, rather than PX/LIN, but a sector re-rate could drag down multiples for all. Our assumption around synergies is in part a function of the very high SG&A costs at Linde today but also reflects our history with PX, watching the company steadily optimize every aspect of the business – as the merged entity begins to operate we expect earnings to see a constant cost based push even if the companies stop referring to the source as synergies. With Praxair management taking both the CEO and CFO slots at the new company we are confident that the Praxair cost DNA will spread. Deere’s announced $5 billion acquisition of German road construction company Wirtgen has been greeted favorably – pushing even higher a stock that has been very loved over the past six months, despite continued pressure on farm incomes and the agricultural chain generally. 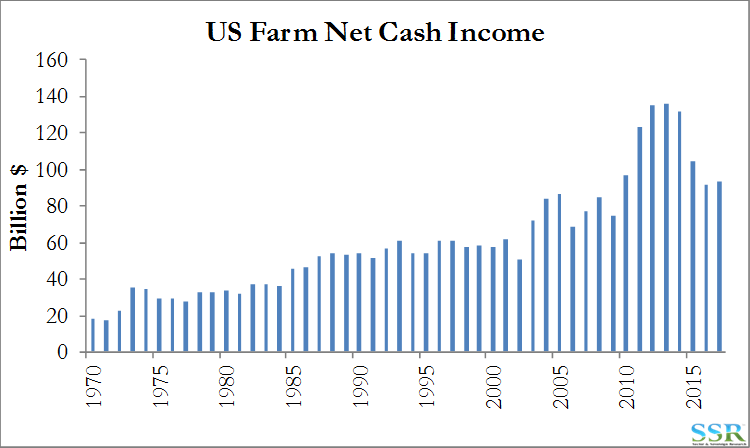 DE is cheap on a normal value basis, but farm based earnings are so far below normal that it is fairly valued based on its current returns – it has a Skepticism Index of close to zero. 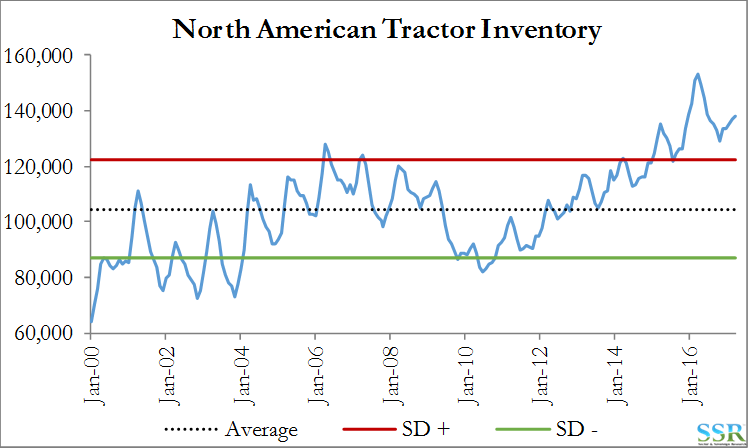 The farm equipment issue is neatly summed up in the first two charts below, which overwhelm the recent bubble of enthusiasm caused by Brazil. The company’s existing Construction and Forestry segment has averaged ~20% of DE sales over the past three years. With Wirtgen’s sales (€2.6 B in 2016, or ~$3 B), construction will now account for close to 30%. Diversification away from an ag cycle that has the risk or remaining weaker longer than expected because of significant gains in productivity should be seen as a positive, and the stock reaction on Thursday seems to confirm this, even if the deal is unlikely to move the earnings needle materially. On the surface, road construction seems a low margin and somewhat off-piste target business for DE, yet a closer look indicates the potential strategic fit and growth opportunity. The company did well to clearly illustrate how Wirtgen’s products complement DE’s existing offerings in the road construction process. A recent Bloomberg article noted the significant level of infrastructure under-investment in Germany – though this is a condition that also exists in the United States, and has been pushed aside for decades. 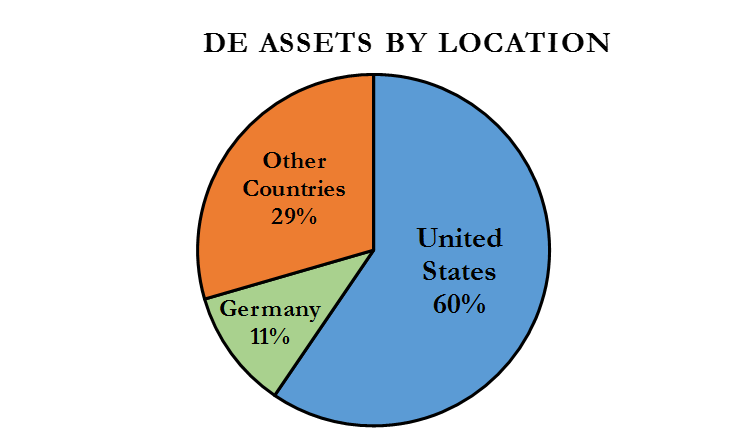 The broader topic of that article, however, was the Trump administration’s indictment of Germany’s current account surplus, one of the main points of contention that have arisen between the two countries. Earlier this week we saw the German economic minister speak out in consideration of Germany’s workers with respect to the pending Praxair/Linde merger – there is a risk that this type of obstruction becomes a recurring retaliatory tool for Germany to strike back against US accusations and may prove an impediment for future deals including this one, especially if German jobs are at risk. Interestingly, DE breaks Germany out separately when listing its assets, suggesting a reasonable presence and understanding of the market. It also suggests synergies – i.e. job losses, which may attract negative attention.